These hardy plants are grown for their silvery foliage. Tolerant of heat and drought, they provide color contrast as borders around the garden or in beds with other annuals or perennials. Easy to grow. 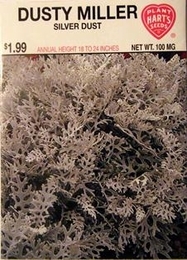 While grown as an annual in the Northeast, Dusty Miller is a half hardy perennial and will survive mild winters or when mulched for protection. Thinning - when plants are 2-3 inches tall thin to 12-18 inches apart.